Nerve isn't perfect, but the fundamentals are tight and it has some terrific features that make it stand out from the pack. Great sample. Unique effects section. Intuitive interface. Easy sidechain compression built in. MIDI mapping not great. Could do with its own browser. Following on from the success of last year's Deadmau5 sample pack, Xfer Records has launched into the software world proper with Nerve, a drum machine with a powerful effects section and sequencer, up to eight stereo outputs and, refreshingly, no authorisation codes or dongles to contend with. 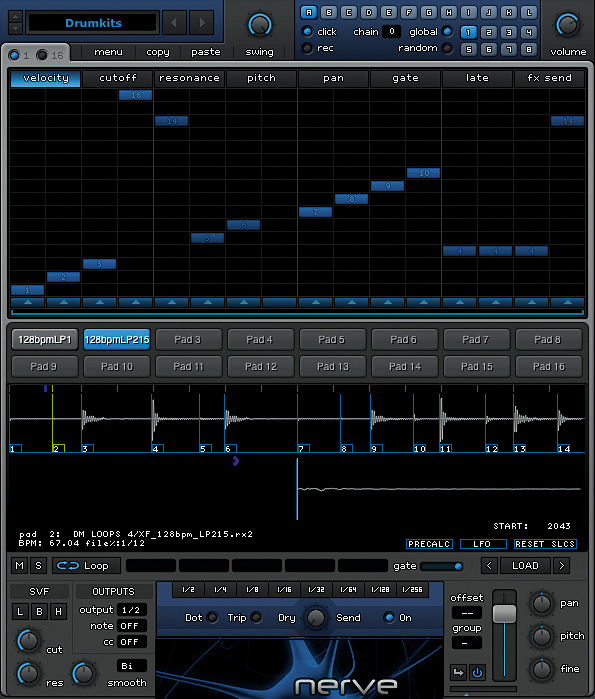 Nerve's interface is divided into three main sections: the pattern editor, the pads and waveform section, and the mixing section. The pattern editor has two different views: '1' and '16'. When '1' is active, you program one parameter at a time, accessed via tabs such as Velocity, Cutoff, Pitch and Late. 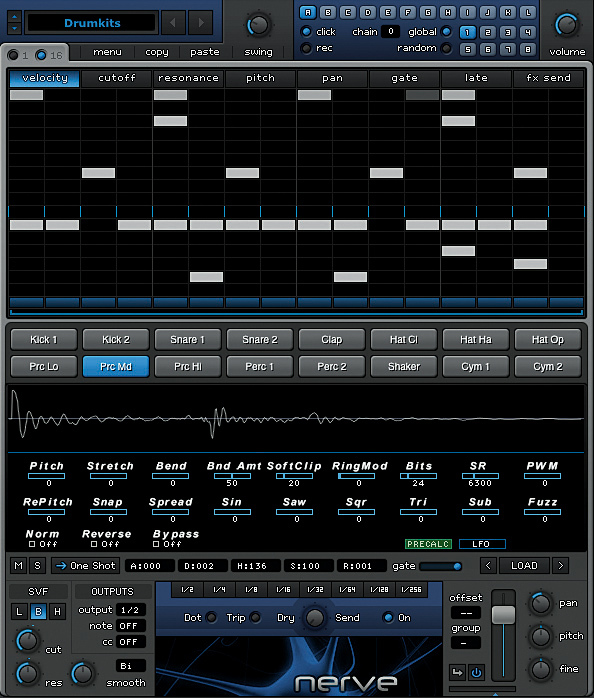 '16' mode changes the view to the classic piano roll-style programmer. There are also keyboard shortcuts - eg, Alt-dragging introduces a per-step repeat that's ideal for glitchy stutters. The system for loading and saving kits and patterns is pretty comprehensive - it's possible to load/save kits, complete patterns, individual pad patterns, the step sequencer automation data sans notes, grooves, MIDI note out mappings, and the whole lot as one FXP file. Confusingly, though, none of the kits have names referring to what they sound like, which is frustrating when seeking something specific. Of course, it's possible to load sounds from your own collection of AIFFs and WAVs onto the pads, or from the Nerve library (via the Load button underneath the waveform). But, as there's no way to preview what you're about to load, it becomes a guessing game. Nerve's thorough sample editing capabilities do come to the rescue here, though, as it's possible to rapidly reshape any sound. In the lower part of the GUI you'll find the pad section and waveform editor - where Nerve really comes alive. There are 16 pads, each loaded with a sample or loop - more on loops shortly. Clicking on a pad will display its waveform, where you can adjust the amplitude envelope by dragging nodes. It's very straightforward, enabling you to, say, trim the snare or tighten up the kick quickly. Clicking on the PreCalc button will take you to the effects section. The depths to which you can dig into sound shaping really can't be overstated, ranging from fairly typical effects like pitchshifting, standard pitching, ring modulation, bit-crushing and clipping, to more esoteric ones such as subharmonic synthesis, PWM and sine/square/saw/triangle resynthesis. You can create distorted, crunchy, lo-fi monsters from samples in seconds. Anyone familiar with Deadmau5's sample pack will know exactly what kind of swirls and bleeps to expect. "The depths to which you can dig into sound shaping really can't be overstated." All of the effects are precalculated, meaning that they're applied directly to the sample data and thus take no toll whatsoever on your CPU. The downside is that you can't manipulate or automate their parameters. In use, we didn't find this much of a hindrance, as once you craft and carve your sample into its new form, you'll tend to leave it be. If you do feel that a sound is too static, each pad has an LFO that can control numerous parameters - it can even send out MIDI CCs for controlling other devices, too. Finally, the mixer area offers options to adjust filter type, resonance and cutoff, set output routings, mute and solo, and other channel-style controls. There's an intuitive sidechain pumping function, too - click the 'arrow' button to select a pad source, set the Ratio slider and every pad with the function enabled will pump in response. Right in the centre is the Repeater section, enabling triggerable stutters from 1/2 to 1/256 of a bar. Individual pads can be switched on and off, so only the parts you want to stutter will do so. However, it's not controllable via the sequencer, so it's more of a live tool. The MIDI implementation isn't great. You can change the CC assignments by editing the nerve.cfg file in a text editor, or if your DAW supports it, map MIDI to automatable parameters. It would be great to have a standard MIDI Learn button on the GUI itself, though. Once you've got some patterns together, you can use the Chain function to sequence them, or flip between them using host automation. You don't have to use the pattern functions, of course, as you can trigger the pads using MIDI. The way in which Nerve deals with REX, REX2 files and loops in general is quite intuitive. Drag a loop or REX from your browser (Nerve doesn't have its own) and the plug-in will detect all the hit points and lay out up to 16 triggers that you can then rearrange, not unlike FL Studio's Slicer plug-in. This is really useful for extracting hats or claps from other material and reprogramming them to suit your project. Furthermore, when you import a REX or REX2 file, Nerve will extract the swing information and apply it to the rhythm as automation on the Late tab. This operates like an offset delay for each step - perfect for introducing step-based swing or more esoteric grooves, as you wish. Whether you've dialled in a groove yourself or extracted it from audio, you can save it as a preset to apply to other loops in the project so that everything grooves together, or for recall on another session. This is a very useful feature that works like a charm when it comes to getting your rhythm parts bouncing and moving together. Nerve is a much deeper plug-in than its slim GUI would suggest - we recommend reading the manual to learn about its full feature set. It's true that it lacks many standard effects you might expect from a drum programming tool, such as reverb, delay, compression, but you've surely got plug-ins aplenty that can handle those tasks. 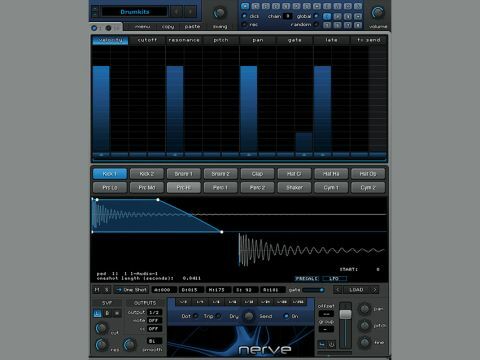 It's the sound-sculpting tools that are the focus of Nerve, and they're both powerful and fun. Add to that the creative groove implementation, over 2GB of artist-created samples, the comprehensive LFO and the Repeater function and Nerve has a lot of bases covered. It's especially great for producers of house music (and all its branches and offshoots) and if you already own Deadmau5's sample pack, you'll absolutely love it. In fact, for anyone who uses a lot of samples and loops, Nerve could well be the next level.